Whether Clemson Tigers coach Dabo Swinney wants to admit it or not, he has another superstar quarterback in Trevor Lawrence. 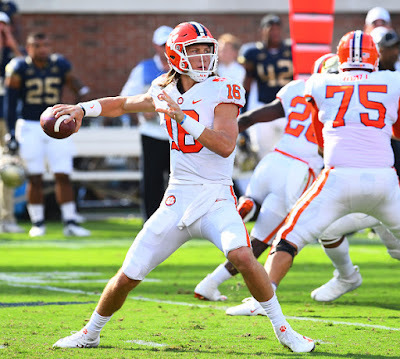 After starter Kelly Bryant struggled to move the ball in the opening quarter, Lawrence came in and casually tossed three touchdowns before halftime. And when third string quarterback Chase Brice threw a late interception, and Georgia Tech closed to within 21 points, no worries, just put Trevor back in the game. I remember seeing a cut away on the Jumbotron at about eight-minute mark of the fourth quarter. Bryant and Lawrence were chuckling with each other on the sideline. There’s most definitely no animosity between the two dual threat signal callers. And when Swinney instructed Lawrence to check back in the game late, everybody at Bobby Dodd stadium in Atlanta, Ga., knew what was about to happen. Five plays and 77 yards later, Clemson further solidified a dominant road conference win. The freshman phenom added a fourth touchdown pass as he hit Tee Higgins for a 30-yard strike to put a bow on the 49-21 victory. As well as Lawrence has performed, the sensational sophomore known by teammates as ET, has been truly out of this world. In the last two games, Travis Etienne averaged over ten yards per carry while picking up three rushing touchdowns. Today, he also picked up his first ever receiving touchdown as a Clemson Tiger. Etienne talked about his determination and fierce relentlessness around the endzone. While there’s no doubt who the leader of the running backs is as Swinney is a bit more non-committal when it comes to the quarterback position. The undefeated Syracuse Orange come to town on Sept. 29. It was last October when Eric Dungey’s three touchdowns led the Orange to an improbable victory over the then-defending national champions. Dungey is back and looking better than ever. But just who will get the start for Clemson? “We’re not going to set depth charts in postgame press conferences,” Swinney said. Let the uncertainty build over the next week as the Tigers face arguably their toughest test yet with the Orange.